If you're a BlackBerry Developer in the Philippines then this is for you. 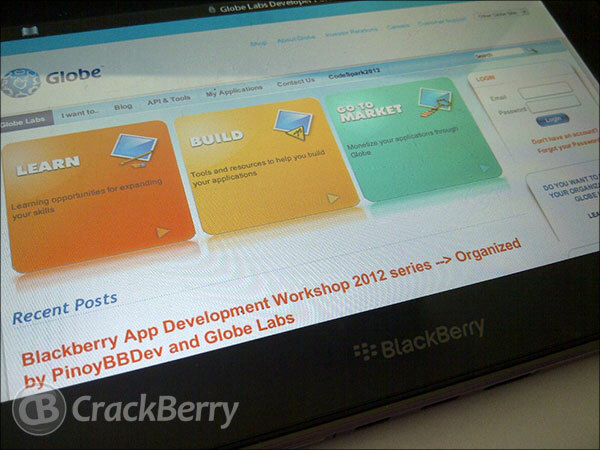 Globe labs and PinoyBBDev are launching a series of BlackBerry App Development Workshops later this summer. The workshops aim to give developers all the tools needed to develop for the BlackBerry platform. The workshops cover four out of five of the BlackBerry development tools - Adobe Air, Android Runtime, WebWorks and Native (Cascades). Please be aware that these may be subject to change to once registered keep an eye on emails or the Globe Labs website for upates. All workshops will be held at Corporate Showroom, Ground Floor, Valero Telepark, 111 Valero Street, Makati City and sessions are free but have limited spaces so register early. It is also nice to know that these workshops are also supported by RIM.